The importance of design has often been neglected in studies considering the history of structural and civil engineering. Yet design is a key aspect of all building and engineering work. This volume brings together a range of articles which focus on the role of design in engineering. It opens by considering the principles of design, then deals with the application of these to particular subjects including bridges, canals, dams and buildings (from Gothic cathedrals to Victorian mills) constructed using masonry, timber, cast and wrought iron. Contents: Introduction; Design Rules and Methods: The mechanisation of design in the 16th century: the structural formulae of Rodrigo Gil de HontaÃ±Ã³n, Sergio Luis Sanabria; Designing the beam: from rules of thumb to calculations, David T. Yeomans; History of retaining wall design, J. Kerisel; The use of models in nineteenth-century British suspension bridge design, Denis Smith; Brunel and the design of the Clifton Suspension Bridge, R.F.D. Porter Goff; History of building foundations in Chicago, Ralph B. Peck; Theoretical Justification in Design: The Gothic cathedral: design and meaning, Otto G. von Simson; Stability concepts from the Renaissance to today, Rowland J. Mainstone; The place of Sir Christopher Wren in the history of structural engineering, Stanley B. Hamilton; The origin of iron beams, A.W. Skempton; Thomas Tredgold (1788-1829): some aspects of his work (part 2: carpentry), L. G. Booth; Thomas Tredgold (1788-1829): some aspects of his work (part 3: cast iron), R.J.M. Sutherland; The birth of stress: a historical review, R.J.M. Sutherland; Progress in Engineering Design: The genesis of engineering: theory and practice, A. Rupert Hall; The functions of engineering research in the university, A.J.S. Pippard; The design of structural ironwork, 1850-1890: education, theory and practice, Stanley Smith; Structural design by observation of failures: how the Gothic master masons determined the dimensions of their structures, Henry J. Cowan; The Britannia Tubular Bridge: a paradigm of failure driven design, Henry Petroski; Structural failures and the growth of engineering knowledge, D.I. Blockley and J.R. Henderson; The evolution of structural engineering design procedures: a history for that skill called design, William Addis; Index. From dams to cathedrals, from water supply to transport systems, and from land drainage to the design and construction of ever larger and more monumental buildings, the impact of civil engineering on human history has been immense. This series sets out to examine key aspects of its history, from antiquity to the early 20th century. Studies in the History of Civil Engineering focuses on the following areas: the analysis of early structures to discover how ancient or medieval builders used the materials available to them, and the principles upon which they worked; the ideas and practices of design as employed by both engineers and architects; the development of new materials and techniques, from wooden trusses to cast iron and concrete; the investigation of the great engineering projects that began to burgeon with the 18th century, first in Britain, then elsewhere, underpinned by advances in science which provided a new theoretical framework upon which to base the engineering. These volumes reveal the implications for the history of architecture of choices of material, technique and structure. They aim also to reflect the political and economic constraints which so often shaped what could be achieved, and the inter-relationship between the history of civil engineering and economic history: the engineering was both stimulated by, and made possible the spread of industrialization. Not least, the series is concerned to examine the lives, attitudes and careers of the men who emerged to form the new profession of the engineer. 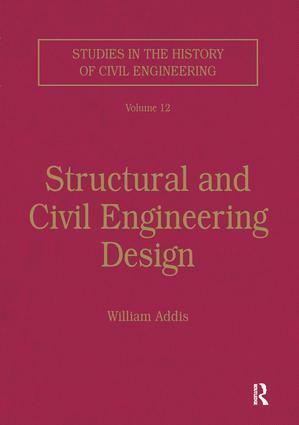 Studies in the History of Civil Engineering comprises 12 volumes. Each focuses on a particular topic, edited by an expert in that field. They reprint a selection of papers which have proved of particular importance, and which exemplify the current state of knowledge and the historiography. Originally published in wide range of scholarly journals, conference proceedings and the like, many hard to consult, these papers are now reprinted together under hard covers, making them readily accessible, even for non-specialists. Each volume opens with a substantial new introduction by the editor, to assess the field and place the papers in their context, and is fully indexed. The series constitutes an authoritative reference library, not just for those interested in the history of civil engineering, but also those studying economic history and the history of science and, above all, of architecture.